Skyriders app: insight & download. Compatibility: Requires iOS 4.3 & up. 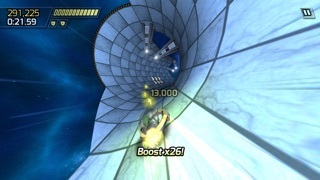 Inspired by classic games of the past, Skyriders is a fast-paced mix of platformer and racing game. 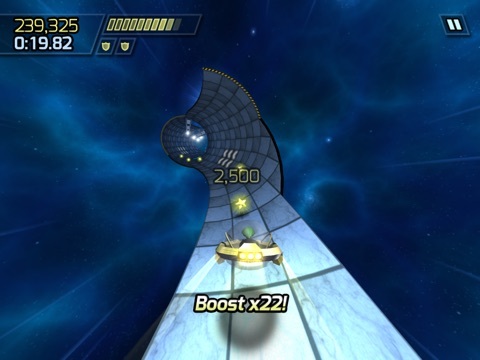 Pilot a small spacecraft along crazy tracks in space, dodging and jumping obstacles, whilst trying to maintain a high speed by collecting the glowing stars and hitting the boost pads! Keep the boost streak going for massive scores and flawless runs - but you'll need some well-timed switching between red and yellow to grab the matching stars! Can you master the increasingly challenging stages, get the gold medal scores, and climb those leaderboards? ★ Support for the new iPhone 5 screen! ★ Universal App, supports iPhone 3GS/iPad 1 and above. ★ No in-app purchases! Buy once, play forever!